These units can be used by various professions including Salon (Beauty, Barber, Massage), Spa, Restaurant and Medical. 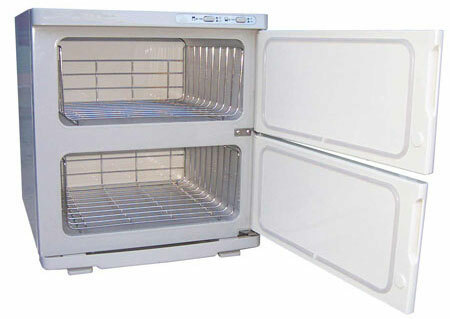 Hot Towel Cabinet - Compact, twin Cabi's, 2 x 15 litre. (#CAPH009). Price: $495.00 incl GST. Add to cart. Large capacity using 2 shelves (15 litres in each). Removable tray inside each cabi. Drip tray included to catch condensation. Individual power switch to control each unit. Power rating - 240 volts, 60 Hz, 350 watts. External: 41 x 42 x 45 cm (L * W * H). Internal: 33 x 33 x 15 cm (L * W * H). Normally used with wet Face or Manicure sized Towels. before putting them in the heater. All Beauty stock displayed at Capital Salon Supplies. Online payments - using Pay Pal, Visa or Master Card. Internet Banking and Cheque are also accepted. Further information available on (02) 6162 1950 or by email .